be updated with YUM as usual. symlinks and not directories like in Fedora 16 and older. more than welcome, and any feedback is greatly appreciated. data, do not try this on a production system, and always have a backup of your data. specified on the kernel command line for these disks (see man dracut.kernel(7)). #fedora-devel on freenode, or contact us by email directly. 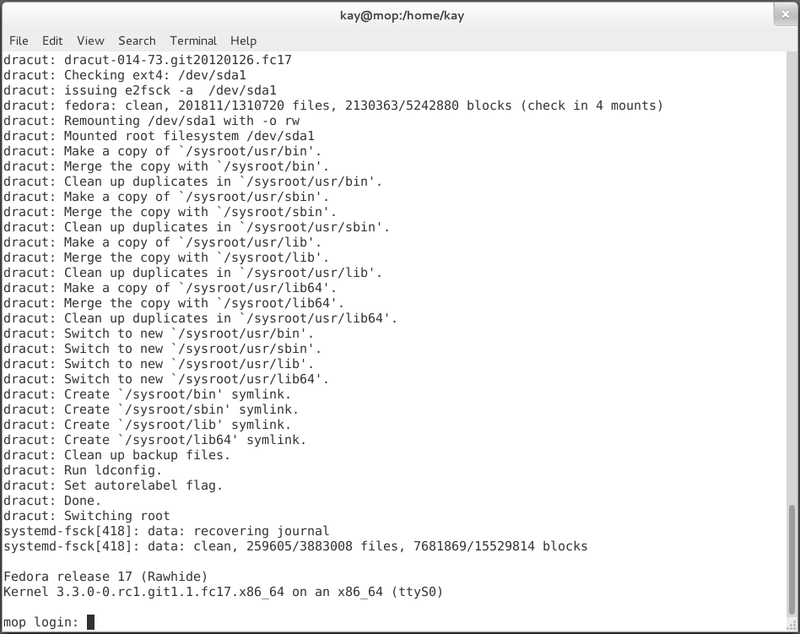 the filesystem conversion of the root filesystem. menu, which is shown during bootup, or edit the line in /etc/grub*.cfg. packages from F16 or F15, or older rawhide packages must be installed anymore. Make sure to disable any F15 and F16 repositories in yum! line in the bootloader config file /etc/grub*.cfg. might consider to test with SELinux disabled for now. After upgrading, all should be set and done.